Cervical cancer is a leading cause of cancer deaths among women in low- and middle-income countries. This is the case even though it is one of the most preventable and best understood types of cancer. Cervical cancer screening can prevent most cases by finding changes in cells in the cervix early, before they become cancerous, so the abnormal cells can be removed. There are also vaccines that help prevent infection with the types of the human papillomavirus virus (HPV) responsible for most cervical cancers worldwide. For developing nations, though, the costs of the current vaccines or of implementing a screening program are often prohibitive, keeping already-strained healthcare delivery systems in such countries from being able to take action to protect their citizens. To help bring down the cost of HPV prevention, researchers are working on finding a different way to attack it. The way the current vaccines work make them expensive to produce, according to Patricio I. Meneses, Ph.D., a researcher at Fordham University, who, with the help of an American Cancer Society grant, is in the process of looking for new and less expensive ways to prevent – or even treat – HPV. To do this, Meneses is investigating 3 ways to improve upon the current vaccines. The first has to do with bringing down the production costs. Existing HPV vaccines prevent certain types of HPV infections from occurring partly by stopping the virus from being able to attach itself to the person’s cells. This requires manufacturers to include a highly engineered type of particle in the vaccine, which is the costly part, says Meneses. 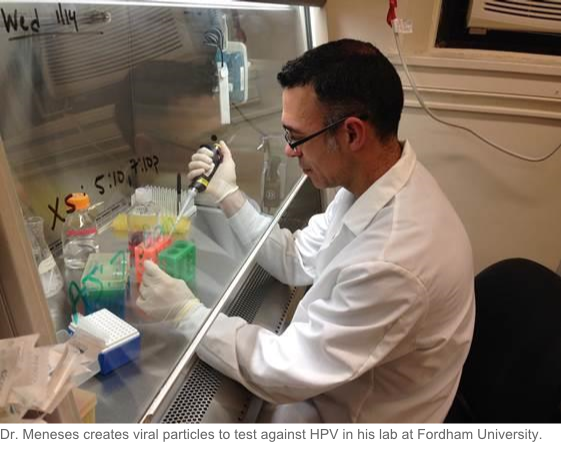 He is trying to figure out how to prevent or treat HPV with a much simpler and much less expensive type of vaccine. Meneses’ second goal is to find a way to address all types of HPV. Existing vaccines offer protection against the individual types of HPV included in the vaccine (recently up to 9 different types). But there are more than 100 different types and maybe two dozen with a potential to cause cancer. And, his third hope is to find a way to treat ongoing HPV infections, since the vaccines on the market now are only effective in people who have not yet become infected. In order to address these 3 goals, Meneses is studying all of the individual molecular steps in the HPV infection process. “Current vaccines target the binding of the virus to the cell. 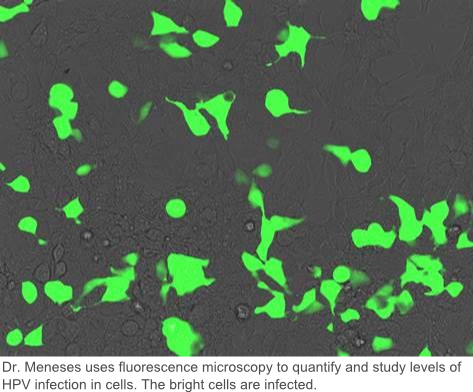 We study those events, but we also study events that occur once the virus gets in the cell, so what it does to actually cause infection,” says Meneses. The idea, he says, is that all types of HPV infect cells in the same or in a similar way. So if he can figure out how HPV goes about infecting cells, he can test ways of stopping the infection that could work against any type of HPV. Meneses says he and his team have already created an antibody – an infection-fighting agent – that appears to be able to stop the HPV virus once it enters the cell. He has thus far tested the antibody against HPV 16 and is in the process of testing it in other types of HPV.